Search The Sports Blogs Network! 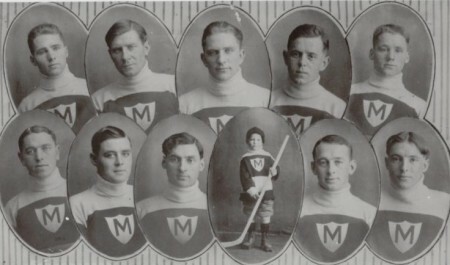 The MELVILLE " MILLIONAIRES" hockey club. Melville was named after Charles Melville Hays the Grand Trunk Pacific Railway general manager who drowned in the sinking of the Titanic back in 1912. The STORY has it that Charles had gathered together a group of potential investors who were all millionaires and interested in helping the growth of the Township. Melville became a City in 1960. Nipper the dog, HMV and Montreal hockey. 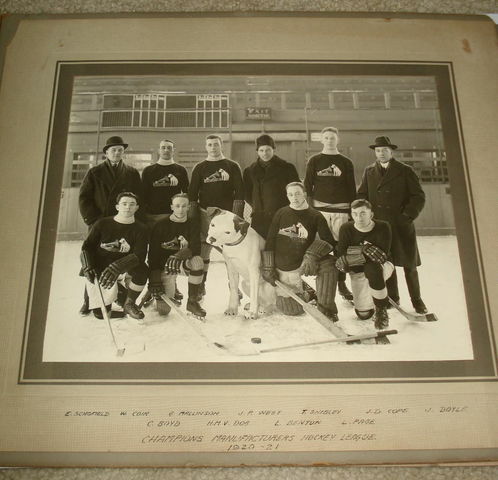 Here we have a photograph of the Nipper HMV hockey team but properly known by it`s original name BERLINER GRAMAPHONE hockey team from the Montreal Manufacturers League. This league was formed around 1910 and lasted till the turn of the second world war when clubs found it extremely difficult to field a team when players were called up. I will do my next article on this league and some of the other teams involved. 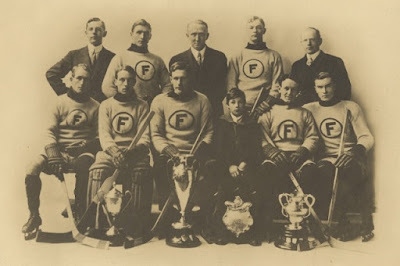 When this photograph was taken it is mentioned in it`s title that they were the Champions of the Manufacturers Hockey League 1920/21 but I am still researching this and many other amateur teams and would be delighted if anyone had any interesting information about these leagues, teams of the early 1900`s. I have found some articles in the Montreal Gazette and in the 1923 April 9th edition it mentions the league and the Berliner team being presented with the Crane Cup as champions of the four team league in which it concluded early in march. The captain George Mallinson (back row third from left) expressed the pleasure of his teammates in being the First to have the club name inscribed on the trophy. 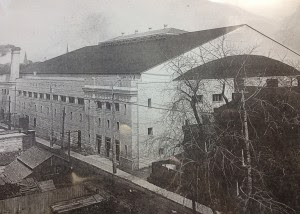 The Manufacturers League games were played as double-headers at the Victoria Rink the same rink that saw the first ever recorded Ice-hockey game back in 1875. Picture below shows the Victoria Skating Rink during a game in 1893. Les Costello and the " Flying Fathers ". 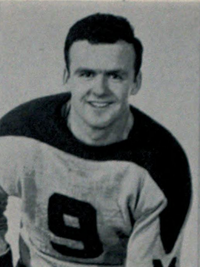 Lester John Thomas Costello (1928-2002) was a Canadian hockey player turned catholic priest. He was born in South Porcupine, Ontario, Canada and as a lot of kids, loved his hockey, he played for the St Michael Majors of Toronto and won 2 Memorial cups with them in 1945 and 1947. His boyhood dreams came true when he was able to put on the maple leaf sweater and play for Toronto in the NHL. The Chicago Baby Ruth`s and Butterfingers hockey teams. 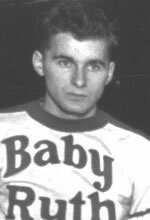 Here we have the logo for the Chicago Baby Ruth hockey team, unfortunately like so many of these amateur hockey teams it is extremely difficult to find pictures showing their logos. This was one of the main reasons my starting these blogs in the hope of getting information. So if you have anything that could be of interest please contact me. 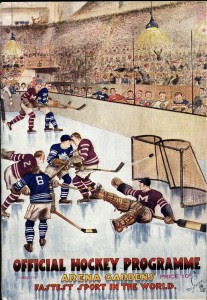 Both the Baby Ruth and the Butterfinger teams played in the Chicago Amateur hockey association during the 1930`s. The teams must have been sponsored by the makers of the two candy bars Curtiss Candy. The Curtiss Candy company was founded in 1916 by Otto Schnering near Chicago, Illinois. The first candy made was "Kandykake" later refashioned in 1921 as the log- shaped "Baby Ruth" their second confectionary item was the chocolate covered peanut butter crunch "Butterfinger" which was introduced in 1931. 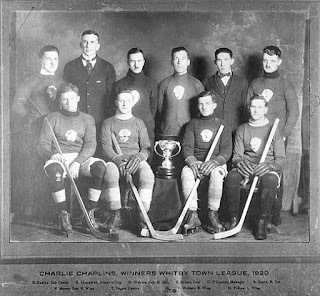 The Charlie Chaplin Ice-Hockey Team. Here is my first blog so bare with me. I am a hockey nut from the UK and fell in love with hockey many moons ago. The NHL fascinated me with all of their fancy logo`s on their jersey`s and the nicknames they used. I craved more and more and read books after books on the history of this wonderful game. Over the last few years I have been researching and reading about the early days of hockey, the grass roots of hockey, the good old days of Company and Industrial leagues. 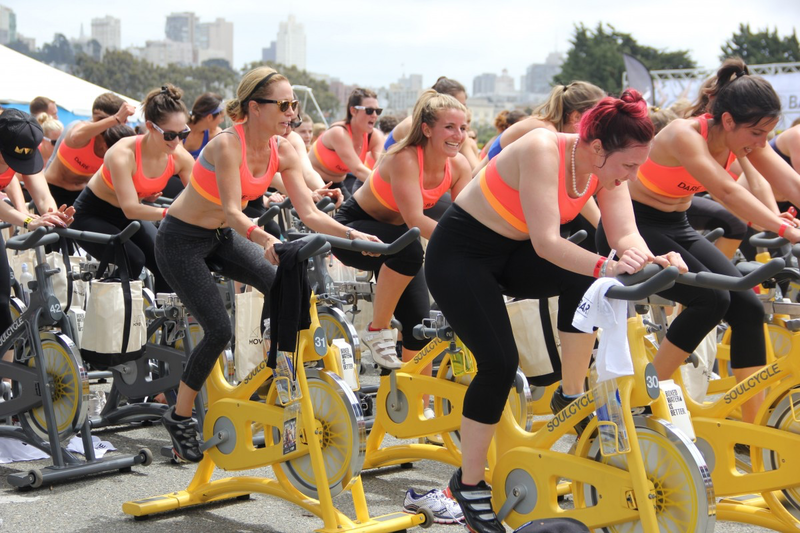 These leagues and their were hundreds of them sprung up everywhere and gave employees a chance to keep fit playing a sport they all loved, playing against other companies teams from the area. Here we have the Charlie Chaplins of the Whitby Town League. Lost in the sands of time perhaps the reason they were named after the great man other than the fact he was so popular at the time. Mr Chaplin himself was a very keen and able roller hockey player who played for Karno alongside Stan Laurel. I hope you enjoyed this first instalment and will read my future posts. Canada`s largest Hardware Retailers of the time. WOOD VALLANCE LTD HOCKEY CLUB. Here we have another example of a sponsorship between a retailer and a local hockey team. But some businesses were so big they were able to form their own leagues and have individual teams formed from different departments, I will write about examples of these in a future blog. The more I research the more I have become aware of the vast numbers of leagues and teams that sprang up all across Canada and the US. Unfortunately a large proportion will just be forgotten, that is why I am trying to collate as much information as I can about these teams before it`s too late. Like so many of these teams and leagues it seems not much was written about them and therefore near impossible to research further than a name, but hopefully with help from readers they may know, or know someone who knows some useful information. Maybe a family member played for a local team, or went to see them play many years ago. Fraser Mills and the Savage Cup. Here we have the New Westminster Fraser Mills Hockey Club of 1914. 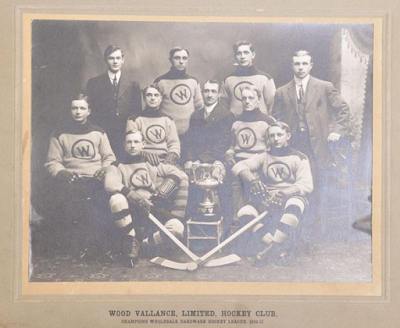 They played in the NWSHL for two seasons from 1913-15 and were Savage cup Champions in 1914. I would love to hear from anyone with more information about this team and the New Westminster Senior Hockey League as any records have been pretty sparse. I have found records of only one player that of George `Trooper` Box a right winger. He had quite an impressive 9 goals from only 5 games not a bad turnaround. When I found this photograph my first thought was this was a sponsorship from a mill of sorts, but then found out that Fraser Mills is a Township sited on the northern shore of the Fraser river. It was the site of the first Sawmill opened in 1889 called the Ross McLaren Mill however it did close down soon after when co-founder James McLaren died. It remained closed for many years until it was taken over by the Fraser river Sawmill. As I have mentioned earlier, finding out about this league and the other teams involved has been pretty fruitless, hopefully with the help of yourselves, more information might be found. Boston Shoe Trades Hockey Team 1920`s. Here we have another amateur hockey team who fielded some influential players in their time. As you may have known I am fascinated in the Logo`s teams used and how they got to pick them. In a lot of cases a hockey teams name had been copied from the towns Football or Baseball team. 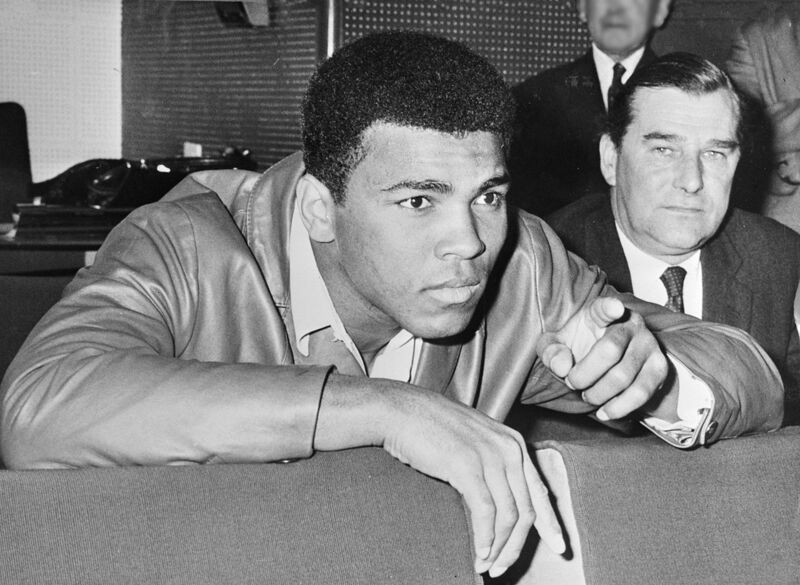 Many others had worn the first signs of business advertising and sponsorship. 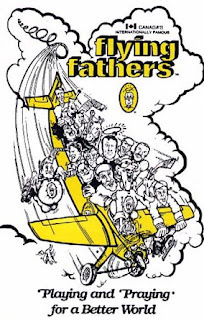 The Boston Shoe Trades Hockey Team have been difficult to research but certainly sound like they are part of the latter, but as always I would love to hear from anyone who has any useful information about this or any other amateur team in the US or Canada. They were known as the `Crescents` before changing to the `Shoe Trades`. They played in United States Amateur Hockey Association for three seasons 1919-22. Results: 1 to 2 of 1087 Click here to Follow this Blog!